1 Up to 13.5 hours of video playback. Testing conducted by Microsoft in April 2017 using preproduction Intel Core i5, 256GB, 8 GB RAM Device. Testing consisted of full battery discharge during video playback. All settings were default except: Wi-Fi was associated with a network. Battery life varies significantly with settings, usage and other factors. 4 Available colors vary in some markets. 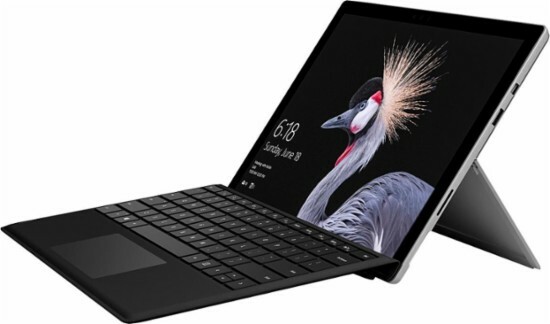 Click the button below to add the Microsoft - Surface Pro - 12.3" - 128GB - Intel Core i5 with Black Type Cover - Platinum to your wish list.